"Cloud Implementation Readiness: Implement a cloud ERP solution"
As your organization plans for and prepares to implement a cloud ERP solution, it’s worthwhile to consider a number of key activities to do in advance of even selecting a software solution provider and implementation services provider. Starting your new cloud based ERP with less historical data will always be recommended by software vendors and implementers and that may actually work for your organization, but you won’t know until you’ve done some analysis and thinking and have involved the right people. This whitepaper talks about the pre-implementation tasks and activities for cloud ERP solution that will allow you to more efficiently work with your software vendor and implementation partner. What are the outcomes of the change management assessment? 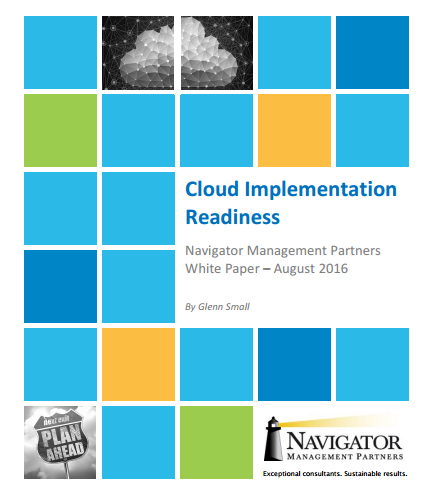 What are the key areas of opportunity to do Implementation Readiness for a Cloud ERP Solution? What are the activities recommended for change preparation and planning? What is Cloud testing ? Real time testing and troubleshooting of mainframes is performed by computers linked with each other over a cloud platform best describes the term. Cloud testing involves data analysis and problem solving from a remote server. It can be considered as outsourcing the maintenance of a set of computers over the cloud. It alleviates the need of additional hardware required with the performance computers at one particular location.